We went ahead and dug up the audio book for you. Everyone deserves the opportunity to have financial success. By following a few great pieces of advice, life can be exactly what you want it to be. Follow the information on the 3×5 card and listen to the book. In the time it takes you to read this article and listen to this little audiobook, make the decision to use these tools for your happily ever after. Have you made the decision to use this information to improve your financial success? Let us know in the comments below. Get A Financial Life by Beth Kobliner. In this book, Beth shares information geared towards those in their twenties and thirties. The personal finance in this book helps answers many questions that young adults have and normally get bad information when asking their peers. Money Honey by Rachel Richards. Rachel describes the 7 steps you can take to have the financial life you desire and she adds some humor to it. She gives it to you straight to ensure that you get it. 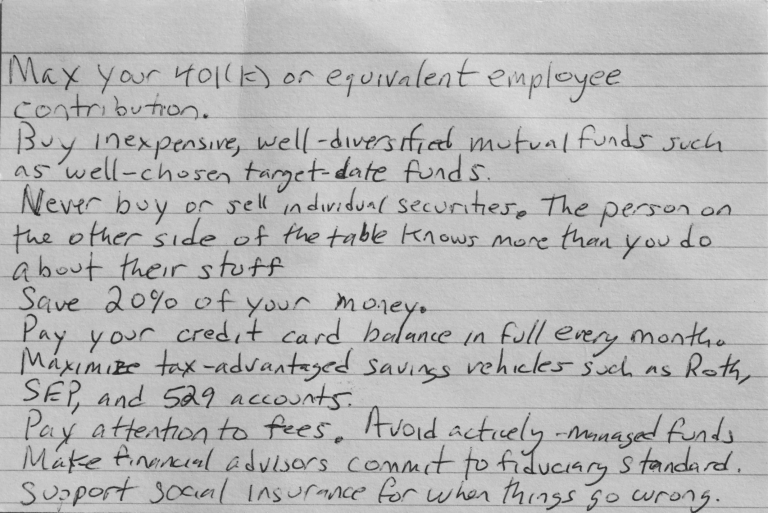 How To Manage Your Money When You Don’t Have Any by Eric Wecks. If you are struggling month to month, then this is the book for you. Wecks explains how to go from being broke to financial stability. I absolutely love this advice and couldn’t agree more with it. I think some of the biggest ones that I see my young professional peers struggling with are: not maxing out their 401(k), (some don’t even contribute enough to get the match), not paying off credit cards in full each month (interest will be a slippery slope to get out of control), and not holding their financial advisors to the fiduciary standard (most of my peers don’t even know what that is). I personally have been focusing more on ‘watching out for the fees’, and was amazed when I found I could be paying 0.08% instead of 0.8% in my 401(k) for a similar fund!